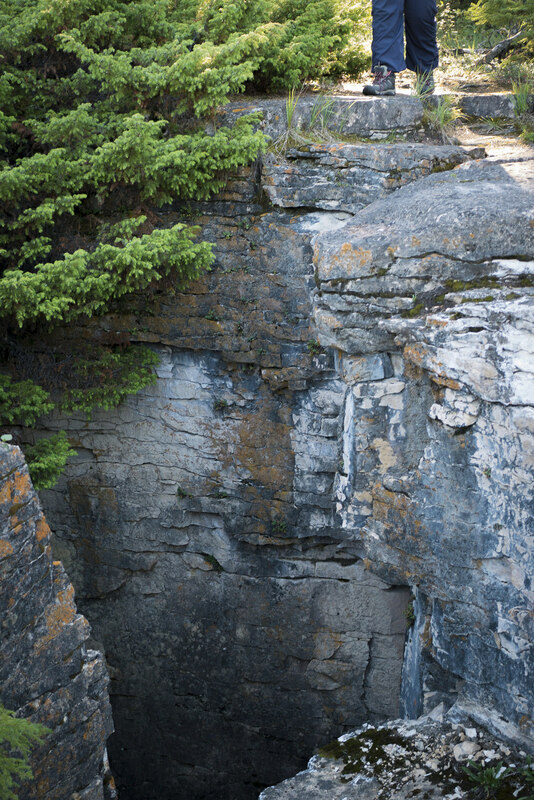 The limestone crevices of Amisk Lake, southwest of Flin Flon, are only a few minutes away. We had planned to camp for one more night, but the motivation fades when I see my grim reflection in the car window. I'm greasier than a carny charging five bucks a corndog. Imagine a sunburned Tom Hanks in Castaway, if all he had sustained on steady supplies of Pilsner and fried chicken. This will be our last stop before heading home. Leaving Denare Beach in search of the trailhead. We cruise past the Meridian Creek picnic area before realizing we've gone too far. As a casual tourist in the area, I had expected to see a sign. We trace our way back up the road until we find a turn leading into the woods. A small gravel parking area and path leads the way. I'm trailing behind the group walking toward the crevices, keeping my eyes focused on the ground to avoid the small cracks that give way to infinite darkness. My ears perk up. "Garbage is f—ing everywhere. People are animals," Sean says in his trademark tone of disgust. In the clearing, I see what he's talking about. Graffiti is all over the rocks, beer cans sit in the pits, and broken glass makes its all-to-familiar appearance. I wish the garbage hadn't been the first thing I noticed, because the crevices are actually quite stunning. The cliffs drop with an unnatural sharpness, creating straight, uniform edges that seem almost virtual. If this were a stage in the game Mortal Kombat, you would be able to do a sweet Fatality here. A small way to jump, but a long way to fall at depths ranging between 20-40 feet. The Limestone Crevices of Amisk Lake are frighteningly steep. From far away, it's hard to tell there are giant pits here at all. It seems as if the rock has been excavated as the foundation for a system of narrow dungeons. They take you by surprise when you walk up to the edge and find yourself staring down into an abyss. If you're scared of heights, you might want to sit this one out. If not, I recommend leaving small children and pets to wait in the car while you jump across the ravines in this live-action arcade game. Thankfully, the litter disappears as we make our way further into the crevices. Nate leads the way from here on, guiding us down the pits until we descend to the very bottom. Accessing the depths of the crevices through a narrow passageway. Light peering through the cracks in the walls. Standing at the bottom of the crevices is like being transported to another country. I've never seen anything like it in Saskatchewan. 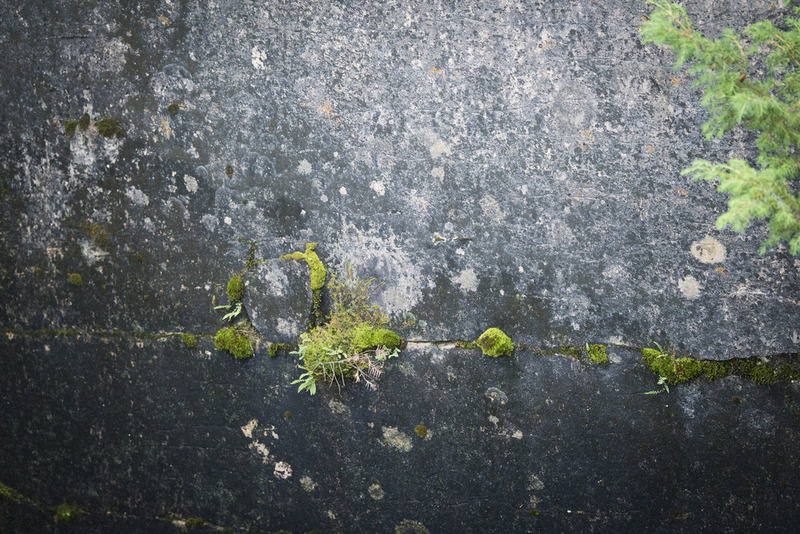 The walls of stone tower above the soft cushioned carpet of moss at your feet, while some corners hold ice and snow that never melts, even in summer. The air is cold and carries an almost-minty scent. This is a welcome treat after being sun-baked for four days straight. Nate continues to guide us through small caverns, ramping up the claustrophobia. The way some of the rock slabs shift as you touch them does not inspire my confidence. Small caves and tunnels are found at the bottom. Walking through these hallways of ancient stone is a humbling experience. Limestone is produced by coral reefs, and the rock here was created in an ancient ocean that existed over 440 million years ago. The crevices were built by the incredible force of repeated freezing and thawing, prying the rock apart during the last ice age. Today, we get to goof around in the cracks. We reach a dead end with no where to go but up. I instantly regret not wearing real hiking shoes. Regardless, we scale the stone walls and resurface in the summer heat once again. It's time to head home.